PART 4 - THE BORDER ELEMENTS. Same old, same old. Not much to report really. 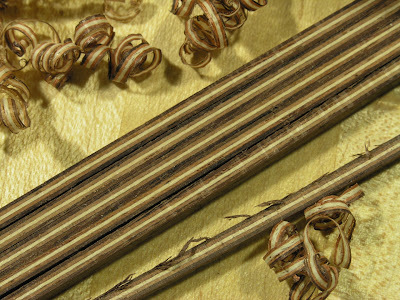 The border log was made from 5 sheets of veneer; Rosewood, bubinga, maple, bubinga and rosewood, cut to size, 1¼"x8", with a Stanley knife and a metal ruler clamped with a MDF caul, using many strokes to avoid splitting and other mishaps and glued together using cut-to-size MDF cauls and wax paper and left overnight. 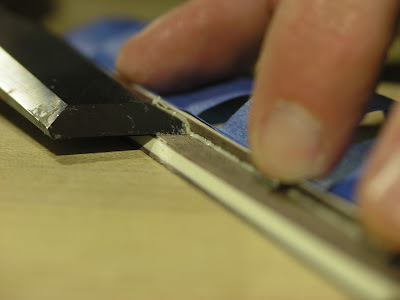 It's a little tricky to keep the veneers from sliding around in the wet glue as clamping pressure is added. My approach was to add very light pressure in one end while trying to keep the veneers aligned with my fingers. This was repeated at the other end. Then little pressure was added to the first clamp again, then the second one again, all while keeping the veneers in place with my fingers. 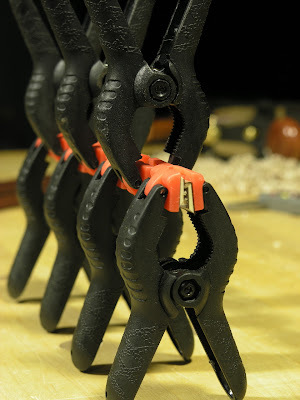 The two middle clamps were fastened in the same manner and all four clamps were slowly tightened. 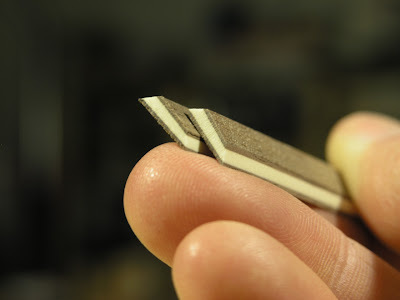 The trick is to squeeze out all the excess glue while keeping the veneers in place. 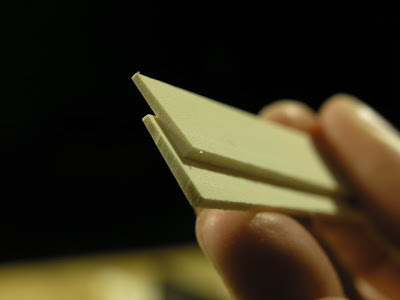 Once the that is done the remaining glue will start to grip and veneers will be locked in place. 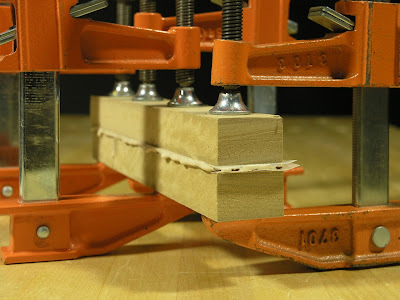 After the glue had dried I sliced the sandwich up into 6 even little logs on the bandsaw, turned them 90º around their own axis so they laid facing top against bottom, glued them together and left them overnight. 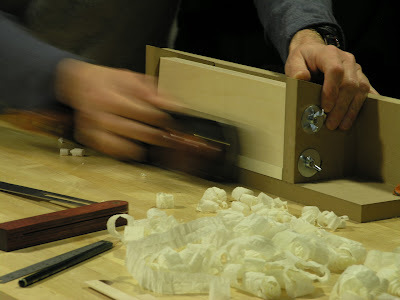 For this last gluing I used 1/8" thin cauls wrapped in cellotape for the sides and a caul to hold the segments down with a massive Bessey clamp, tightened very lightly. 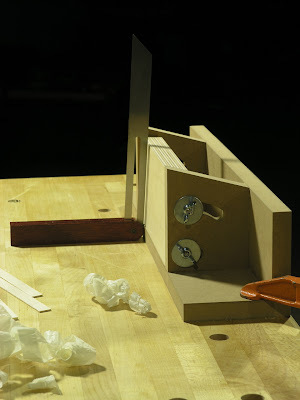 Wax paper was used on the top and bottom to keep the whole setup from gluing together. Last both faces were planed smooth to a final thickness of about 3mm (1/8") using my taper jig and cut into 1.2mm (3/64") strips with a fine dovetail saw. PART 3 - CENTRAL MOTIF ELEMENTS. 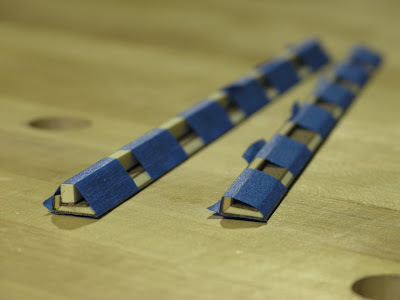 I started off by sticking a long strip of blue masking tape on the segments to align them. 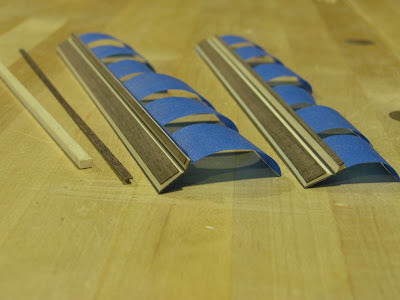 Then I added 6 perpendicular strips of tape that were to function as clamps, added glue sparingly and folded to miter together while wrapping the tape around the work. After about 15-20 minutes I unwrapped the tape and carefully cleaned up the glue with a chisel, and rewrapped one of them again. 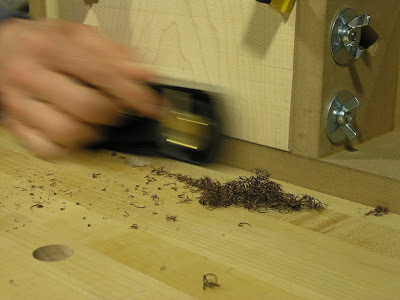 The other was left unwrapped until the center rosewood strip of veneer was glued in place using a piece holly scrap wrapped in cellotape as a caul. Again, after 15 minutes, that segments was unwrapped and the glue was gleaned up around the rosewood veneer. 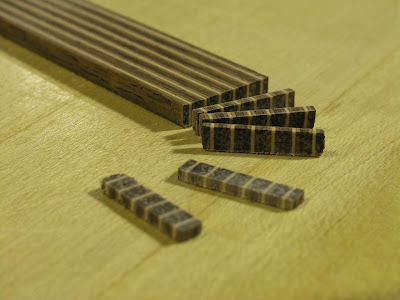 Then I set the taper jig to 3.5º and stuck each segment in and planed the horizontal walnut/maple/walnut part to size. The one with the rosewood veneer attached was planed flush, whereas the one without was left proud to accommodate for the strip, about 0.5mm. 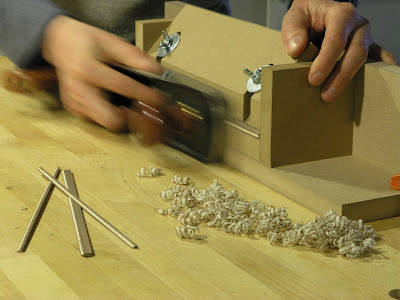 The two components were glued together using small spring clamps. 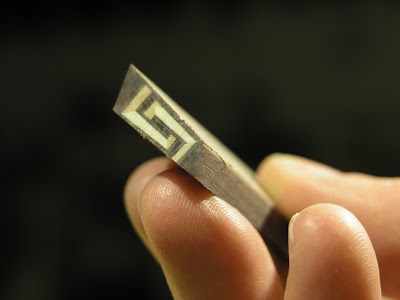 The last two miters were glued on in a similar fashion, though this time the rosewood veneer were included in the gluing. At this point I thought the whole thing had gone horribly wrong; That the final width of the log was too narrow, and the miters were cut wrong, and I reluctantly decided to start all over again. But, to satisfy my own curiosity I haphazardly planed the two protruding segments flush with the sides just to see how it would look like. BAD IDEA! In the process I ended up taking a bit of walnut veneer off the vertical segments as well. While I was figuring out why the log had become too narrow I suddenly discovered that it really wasn't and it all boiled down to me measuring incorrectly. I despair! To rectify the hick-up, I figured out that I could glue on an additional piece of walnut veneer on one side of the log once it was finished and use that for compensation and to adjust the final width and taper if needed. 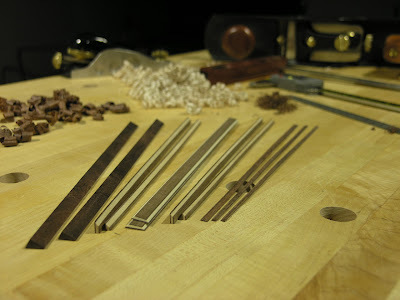 The triangular rosewood pieces were glued on the top and bottom using blue tape and rubber bands and planed flush with the sides freehand, first with a plane, then with a scraper until virtually flush and finally with a very finely set plane to carefully even out small irregularities. The walnut veneer was then added and the log was done. PART 2 - CENTRAL MOTIF ELEMENTS. There was quite a bit of progress on the rosette over the weekend. I got all the tile segments done. 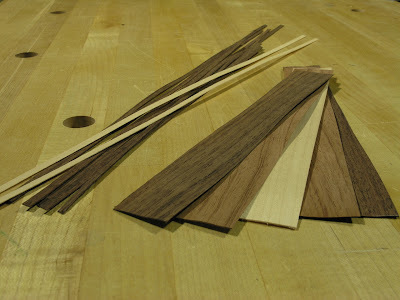 In order to accommodate the taper in the vertical segment I made the upper walnut/maple/walnut sandwich 0.5mm, a fat 1/64", thicker than the bottom one. 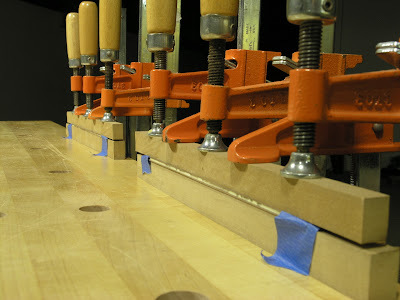 After all the veneer sandwiches were glued, it was time to shoot the miters joints. 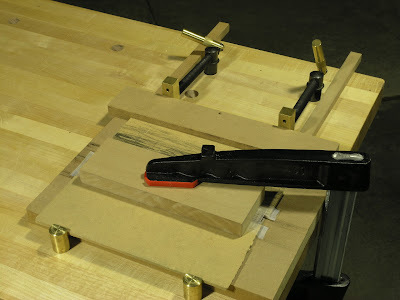 I made a miter jig especially for this task. 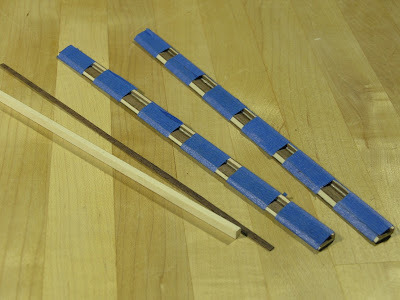 Basically it is similar to the taper jig, however the insert is different. 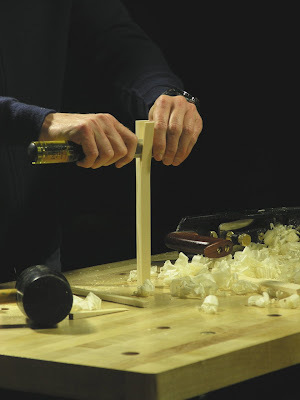 I consist of a miter 'table' or ramp and a sliding fence. The ramp is attached with bolts and can be exchanged with ramps of other angles if needed. The ramp is about 43.5° on one side and 46.5° on the other. This allows for a joint that is 93°on the lower/narrow part vertical segment and 87° on the upper/wider part. This is to compensate for the tiles taper. 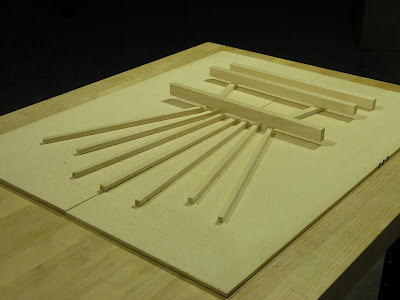 The idea is to give the appearance that the horizontal parts are straight and not bend upwards as they would had the angles been 90°. I used double sided tape to hold the work in place. I had to keep the tongue straight in my mouth (Danish expression for being very careful) to keep track of what part had to be mitered at what angle, but I got through it without mishaps. 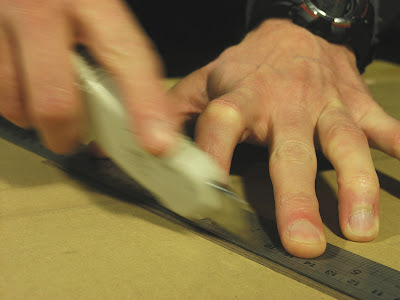 The old saying "measure twice, cut once" came in very handy. The vertical segment were cut to final width, whereas I left the horizontal ones long for later adjustments when the tile segments is glued together. 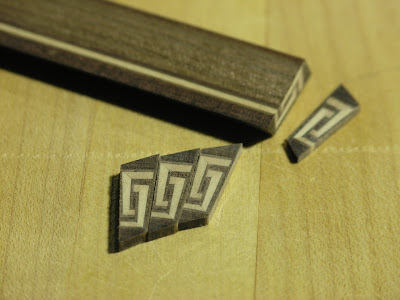 I also made the triangular rosewood segments that goes on top and bottom of the tile. Basically, I planed a 8mm square piece from some scrap leftover from the bridge/fingerboard billet and ran it though my bandsaw at 30° angle. 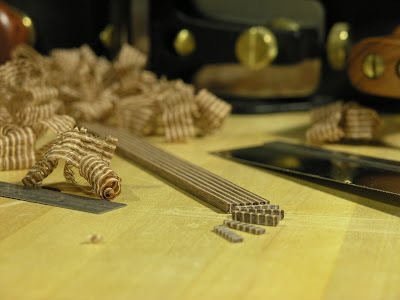 Last I cut the Rosewood veneer strips that goes in the center of the tile. I used a Stanley knife and a metal ruler for this. I did it with many light passes, probably 10-15, in order to keep the knife from splitting the veneer and not to get caught in the grain. 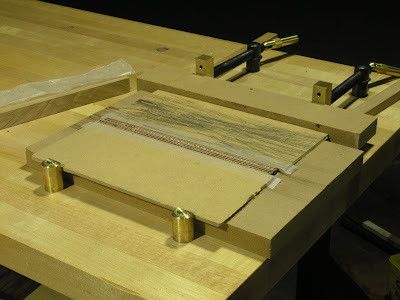 Then I put the strip in my taper jig and held it in place with a 2mm thick piece of maple. 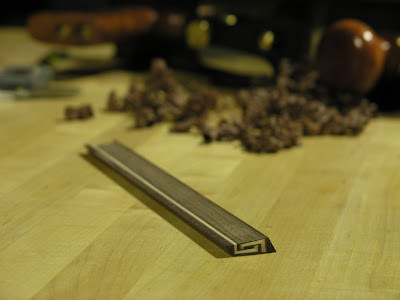 Like the walnut/holly/walnut segments I had to cut the vertical veneer strip to final dimension. 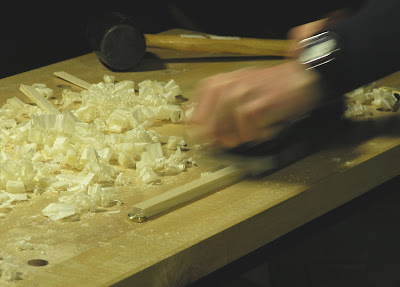 I did that with my block plane. 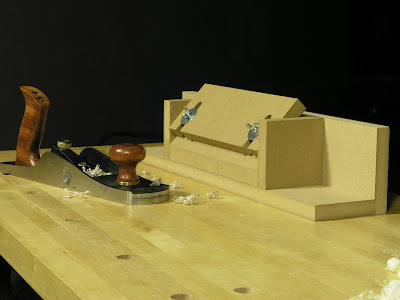 I started of with the jack plane but it was too big and heavy to control. I'll be the first to admit it. I'M GEEKING OUT HERE BIG TIME. But, it was such fun to see how far I could push it. With the segments that I finished to final dimension I ended up with an error of +/- 0.02 or 0.03mm around 0.001". PART 1 - THE CENTRAL MOTIF ELEMENTS. It's been long since my last post. 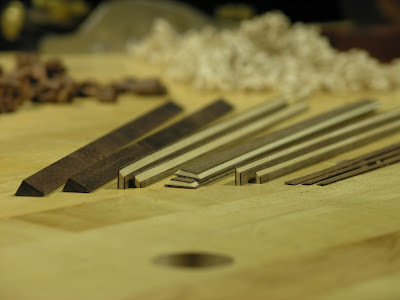 I was stalling for a bit, dreading making the shooting jigs for the individual tile elements, one for shooting a slight taper in the holly and a jig for shooting miters for joining the walnut/holly/walnut and walnut/maple/walnut segments. I finally got it done. 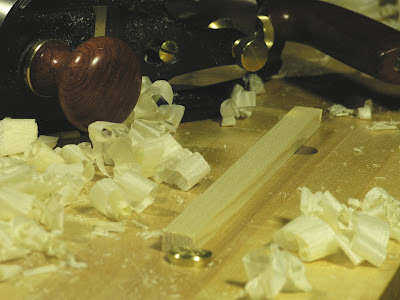 For shooting the elements I'm using my Lee Valley bevel-up Jack plane. It is a wonderful plane; Big, hefty. low gravity and really well tuned right out of the box. 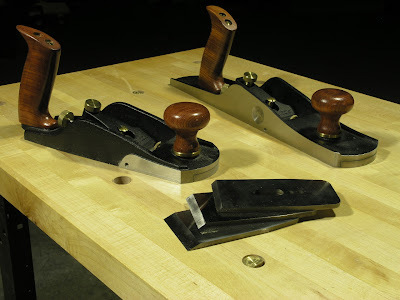 One of the neat things about Lee Valley's bevel-up planes is that they all share the same frog design so blades can be interchanged freely among them. 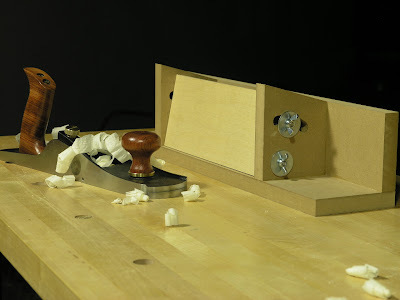 I have a 25º that came with Jack plane a 38º that came with the Bevel-up smoother and a 50º I bought seperately. This is a really versatile setup that covers virtually all applications. 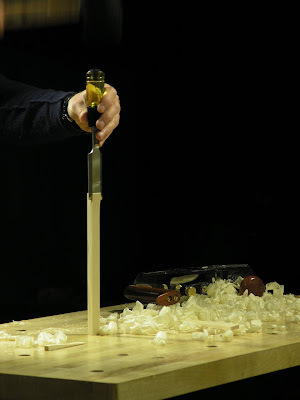 For shooting the taper in the holly I'm using the 38º blade. I calculated that I would need about 51 tiles to complete the circle which comes to about a 7º taper for per tile, or 3.5º per holly strip. 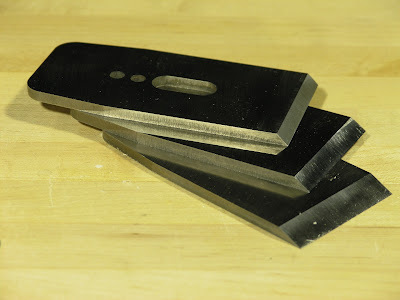 I set the sliding bevel to 3.5º and tilted the jig accordingly leaving a gap of as close to 1.2 mm at the bottom as I could, the desired thickness of the thin side. 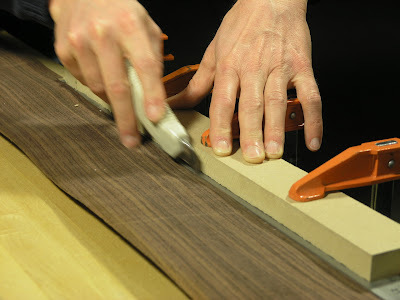 I used double sided sticky tape to hold the strip in place but I deliberately didn't compensate for the that as I left the strip a bit wider leaving room to play once the walnut veneer was glued one ready for the miter to be done.